Oh my goodness where do I start? 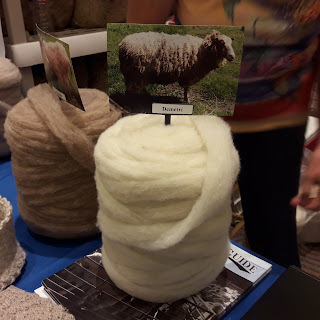 The best thing about the Houston Fiber Fest for me personally were the face-to-face conversations I had with so many folk who are just as passionate about fiber as I am. I could fill several posts with all the wonderful people I met up with and what we spoke about. I will have to limit myself!! First up was Beth Bower from Inner Loop Dyeworks who had provided me with yarn support for my sock design. How kind! I left samples of my leftover crochet sock at her booth. And yes I am seeing pattern sales on Ravelry appear in my in-box since I released it last week! Then I visited Karen at Round Table Yarns. She provides yarn support to Karen Whooley who as you may know is one of my favorite crochet designers. I wore one of her shawls Violaceous both days from her latest book "Garden of Shawls". I had a fascinating conversation with Stacey and Penny at the Brazen Stitchery booth about sock blanks. I'd just found out about these from my friend Claudia in the latest episode of her Crochet Luna Podcast Sock it to me! and I had to buy one to see how it worked up in crochet. 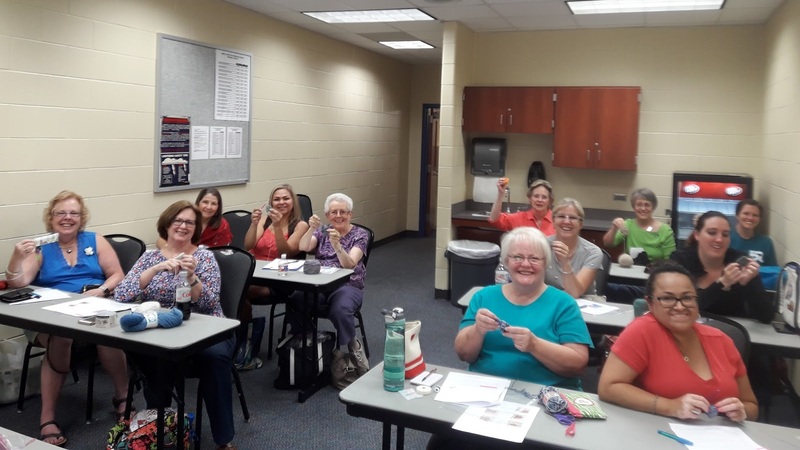 My friend Diane had saved me a seat at the Crochet Meet up Table and there I met my two fellow crochet teachers at the event: Kristi Millsap who was teaching an Introduction to Tunisian Crochet and Carole Fitzgerald who was teaching Crochet Fingerless Gloves. They were both great and we compared notes on what we were teaching. Jessica from Houston Fiber Friends had arranged a meetup for us too. We sat at a table inside the foyer and shortly afterwards starting shopping together. Yes I did shop as well!! Listening to one of our group, Mel, talk about the joys of spinning led me to purchase a drop spindle! At the Foggy Hollow Ranch booth, farmer Lynda sold me fiber for my new spindle from Demetri the highland sheep who is not only sweet natured but has fleece that is easy to spin, so I've been told. Fun times ahead! 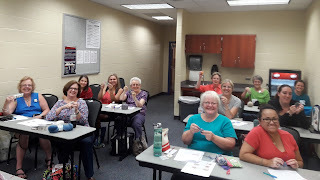 And finally I just loved my twelve fantastic students at my Crochet Sock Techniques class - they were all sooo lovely, had great crochet skills and worked extremely hard. Anyway I hope you enjoyed my brief round up. I am now off to the UK this week to visit my family so I'll be taking a little blog holiday for a few weeks. I will return at the end of July. Have a wonderful summer everyone!! Hi Tamara! 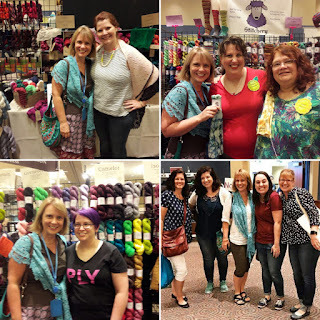 I'm trying to catch up on your blog (as well as about a hundred other things, lol) and I'm so glad you enjoyed your Houston Fiber Fest fun. Your class looks wonderful, I'll bet they learned a lot. Enjoy your break, I'm sure it's quite needed! Thank you Nicole!! Yes it's been rather busy lately! I am looking forward to seeing my family sooo much.